If you are new to wikis, check out the help section. Check out Tasks for a list of jobs that need doing on the wiki. Check out the Community Hub to see what the community is working on, to give feedback or just to say hi. The Last Team Standing Update adds the ability to create Last Team Standing Jobs to the GTA Online Creator, along with three new vehicles (the Furore GT, Hakuchou, and Innovation) and two new guns (the Heavy Shotgun and Marksman Rifle). The San Andreas Flight School Update introduces two new planes (the Besra and the Mil-Jet), the Swift helicopter and the Coquette Classic, and brings the San Andreas Flight School to GTA Online. To celebrate America's independence, the time-limited Independence Day Special adds patriotic-themed weapons (the Musket and Firework Launcher), vehicles (The Liberator and Sovereign) and clothing options in GTA Online. September 3: Fernando Agapito, Jr., who uploaded a number of videos using footage from Grand Theft Auto IV and Grand Theft Auto V under the username Yeardley Diamond, passed away at the age of 28. 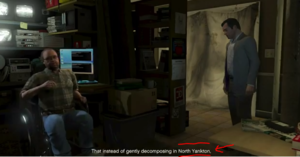 Some of his best known videos include a GTA IV remake of Gangnam Style and Niko's Dramatic Reaction to GTA V.